Under-fire captain Sourav Ganguly will be looking for inspiration from the past to lift his personal form as India go into the crucial fourth one-day cricket international against Pakistan here tomorrow seeking to regain the lost momentum. AHMEDABAD: More than the unbearable heat, it will be the lack of adequate fan support from home that is likely to dampen the spirit of the Pakistan cricket team, eyeing a victory in the fourth ODI against India to level the six-match series here on Tuesday. The Press Information Bureau (PIB), which has never handled press passes for sports events, barring Arjuna Awards functions at Rashtrapati Bhavan, has offered to handle media passes for the one-day international between India and Pakistan at the Ferozeshah Kotla ground here on April 17. The Supreme Court today rejected a plea by an association of structural engineers for stalling the final cricket match of the current India-Pakistan series at the unfinished Ferozeshah Kotla stadium here to be watched by Pakistan President Pervez Musharraf after the Centre and other concerned agencies gave assurances of taking adequate measures for the security and safety of the audience. Mumbai: The practice of spin of the coin to decide the result in inconclusive Ranji Trophy matches may soon be a thing of the past if the BCCI accepts a proposal that on Monday called for abolishing toss as the criteria in declaring the winners. 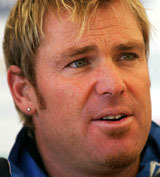 New Zealand fast bowler Chris Martin destroyed the cream of Sri Lankan batting with career-best figures of six for 54 as the Black Caps dominated the opening day of the second Test at the Basin Reserve here today. Captain Graeme Smith compiled 148 as South Africa ground out a first-innings lead against West Indies on the third day of the second Test at Queen’s Park Oval here. Teen star Sania Mirza is unlikely to play in the Fed Cup women's tennis tournament beginning here next week as the world No. 75 is still recuperating from an ankle injury. The undulating greens of the Golf Club here played host to a celebration today after the annual club elections saw a victory of the ‘green brigade’ at the club, putting 1978-batch Punjab IAS officer G.S. Sandhu in the chair. The Himachal Government plans to celebrate the centenary of the Naldehra Golf Course, near here, on a grand scale to attract golf lovers from across the world. The local golf club, which manages the nine-hole course, will organise a series of tournaments to mark the centenary but the basic objective of the celebrations will be to promote tourism. Tiger Woods held off a gutsy last-day challenge by fellow American Chris DiMarco to win the ninth major of his career in a playoff for the 69th US Masters. Woods, winless at the majors since the 2002 US Open, sank a 20-foot birdie putt at the first extra hole to secure his fourth green jacket and his 43rd PGA Tour victory at a sun-drenched Augusta National. Resentment prevails over the district Sports Department’s move to earmark over 400 sq mtrs of land in the Paddal stadium to the Wushu Association, which is not recognised by the Himachal Olympic Association. Mandi defeated Lawrence School, Sanawar, in the nail-biting under-13 boys’ final of the state-level sub-junior and junior basketball championships today at Baldwara, about 30 km from here. Abhijit Gupta gave yet another inspired performance to hold Grandmaster Pavel Kotsur of Kazakhstan in the seventh round of the Dubai International Open chess championship here getting a step closer to his third and final International Master norm. The Indian skipper has been under tremendous pressure after repeated failures with the bat and the clamour for his removal has increased in the past few days. Ganguly would be keen to silence his detractors not only with a big score but by leading his team to an unassailable 3-1 lead. 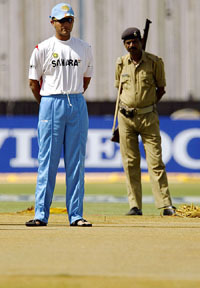 The comprehensive Indian defeat in the third one-dayer at the Keenan Stadium in Jamshedpur, with Ganguly flopping with the bat once again, has added to the tremendous pressure on his shoulders. With his team having relinquished the hold a bit over Pakistan at the Steel city, Ganguly would look behind to the century he scored at the Sardar Patel Stadium in Motera here against Zimbabwe a few seasons ago for some much-needed impetus. Ganguly, whose last one-day hundred came in March 2003 in the semi-finals of the World Cup against cricket minnows Kenya, could also take comfort from the fact that this venue has been among the better ones for India in one-dayers. India, who lead Pakistan 2-1 going into the humdinger of a clash in front an expected jam-packed and vociferous lot of spectators, have won five out of seven ODIs they have played at the Motera ground. On the other hand Pakistan, with their confidence which had taken a beating after the losses in the first two ODIs restored following the Jamshedpur victory, would be playing for the first time at this venue in an ODI. India would also be hoping that Sachin Tendulkar, who has struggled in the series so far and has gathered only 12 runs as compared to Ganguly's equally miserable tally of 13, rediscovers his golden touch at the top of the order. The Indian new ball attack is also a cause for some concern. The hosts fielded a three-pronged left-arm pace attack at Jamshedpur without much success. The part-time spin of Tendulkar, Sehwag and Yuvraj too failed to work. The Indians would be tempted to bring in Balaji for the out-of-form Pathan in case the former has recovered from his side strain which forced him to miss the third ODI. The tourists are likely to go in with the same eleven which won them the crucial match at Jamshedpur. All the bowlers delivered, none more so than Rana Naved-ul-Hasan who broke the back of the Indian batting with his six-wicket haul. Pakistan, however, do not have fond memories of this erstwhile textile city. The last time they played at this venue, in 1986-87, the Pakistan team, led by Imran Khan, staged a walk-out after his team members were pelted with missiles by the unruly and restive crowd. They also came out to field with all the eleven players wearing helmets. Hosts Gujarat Cricket Association had kept aside 400 tickets for Pakistani fans coming from across the border, but only a handful had bought the tickets so far, prompting the association to think about selling the remaining tickets. The Press Information Bureau (PIB), which has never handled press passes for sports events, barring Arjuna Awards functions at Rashtrapati Bhavan, has offered to handle media passes for the one-day international between India and Pakistan at the Ferozeshah Kotla ground here on April 17. PIB officials have no idea about the Ferozeshah Kotla ground or its layout. The Delhi and District Cricket Association (DDCA) has been issued a communication by PIB’s Press Relations Director in this regard. It has asked for 120 passes for correspondents, 75 for the visual media and 15 for PIB officials, who will be placed on duty. Even if the DDCA distributes passes on its own and doles out passes, it will not have to accommodate so many mediapersons. The Press Box at the stadium can at best accommodate 150 mediapersons and entry to outsiders is strictly barred, except the three or four scorers and a couple of assistants. Since Doordarshan has exclusive telecast rights for the match, the visual media passes will be handled by Prasar Bharati and not the PIB. The PIB has asked for blank passes and not passes in the name of the correspondents who will cover the match. The PIB does not have a list of cricket correspondents. Sports correspondents shudder at the prospect of the PIB handling press passes for the Kotla ODI, considering that Pakistan President Pervez Musharraf and Indian Prime Minister Dr Manmohan Singh will watch the match, along with a host of other VVIPs. The PIB official has also asked for four buses to transport the mediapersons from Shastri Bhavan to the Kotla ground. The PIB official has asked the DDCA to ensure that adequate seats are earmarked for mediapersons in the stadium and to apprise the PIB of these well in advance. The PIB also wants the DDCA to ensure that there is necessary work room facility for the mediapersons and that arrangements for drinking water and refreshments are made by the organisers. The stadium will have 14 entry gates and the Pakistan President will drive in through Gate 5. The tickets are to be put on sale from tomorrow though the DDCA has given 2,095 passes to the Pakistan Cricket Board. Meanwhile, DDCA director Ravi Jain has said there will be park and ride facility for those coming in their own vehicles. The DDCA has made parking arrangements at the Ramlila ground, the Yamuna velodrome and the Indira Gandhi stadium parking. It has also made arrangements with the Delhi Transport Corporation to ferry spectators from the parking lots to the stadium and back. Besides, the Centre, Municipal Corporation of Delhi (MCD) and the Delhi and District Cricket Association (DDCA) gave the assurances to the Court that the sitting arrangement in the portion completed was fully safe for the people and the intake capacity of audience had been reduced to 30,000 from 60,000 in view of the work having not been fully completed in a portion, specially the upper tier, which would be completely blocked for the people who go to watch the mach on April 17. The Court, however, kept pending the application of Society for Safe Structures (SSS), an association of structural engineers, challenging the grant of permission to the DDCA by the MCD. The Bench said it would be taken up for hearing after the match. A battery of senior advocates, headed by Attorney-General Milon Banerjee and Solicitor General Goolam E Vahanvati, appearing for the Government, the MCD and the DDCA stated that it was obvious that full security and safety measures would be taken for such a “high profile” match to be watched by Pakistan President Pervez Musharraf and Prime Minister Manmohan Singh. While the DDCA counsel Arun Jaitley and Mukul Rohtagi placed on record various documents and the testing reports on the quality of construction works, given by various agencies to the contractor, MCD counsel Ashwani Kumar said a team of Corporation’s own engineers had visited the stadium and were satisfied that the portion to be used for audience was “fully safe”. The Court said its apprehension about the safety was not merely based on the application filed by the petitioner, but by the statement of MCD Commissioner in Media, raising questions about certain aspects of the renovation work. SSS’s representative Anil Agrawal, who had filed the application in a pending public interest litigation (PIL) by it on safety of high-rise buildings, alleged that the occupancy certificate for the mach was granted under pressure from PMO and the office of Delhi Chief Minister by the MCD. However, MCD counsel clarified that no occupancy certificate had been given by the local body as it had only “permission” to hold the match. This point came up for discussion during the one-day annual conclave of the captains and coaches here. Sri Lanka were all out for 211, recovering from seven for 86, and New Zealand were 52 without loss at stumps. Fall of wickets: 1-0, 2-34, 3-36, 4-41, 5-60, 6-80, 7-86, 8-175, 9-200. Bowling: Martin 20-7-54-6, Franklin 11-1-51-1, Mills 20-6-50-0, Astle 12.1-2-35-3, Wiseman 2-0-12-0. In reply to West Indies’ first-innings total of 347, South Africa resumed on 182 for three yesterday and closed in the ascendancy at 370 for six, a lead of 23 runs. Fall of wickets: 1-70, 2-86, 3-181, 4-222, 5-274, 6-303. The Hyderabad star, who last played in a WTA tournament in Florida in March, will definitely travel to Delhi where she will consult doctors and get their advice before taking a final decision. Sania, who has not taken the racket for the last three weeks since her first round defeat in Florida, has been advised rest by doctors till she gets fully fit. Doctors have now detected some fluid accumulation in her left ankle. It was first found in the USA by the tournament doctor in Miami and was later confirmed by experts in Hyderabad. "I have my doubts but she is definitely coming to Delhi and if fit she will play. It all depends on the doctors' advice," her father Imran Mirza told PTI over phone from Hyderabad. Sania might have a check-up in the capital on April 17 to assess her fitness before the start of the tournament. India is in Group 1 of the Asia Oceania Fed Cup along with seven other nations. The top two teams from the group will advance to the play-off round to fight for a place in the World Group. Group I matches are scheduled to begin on April 20. What seemed like a minor injury which Sania first suffered during practice in Australia two weeks before the start of the year's first Grand Slam in January continued to trouble her all through as he repeatedly hurt the ankle while playing in the circuit. Sandhu polled more votes than the votes polled by the other two candidates put together. Sandhu polled 527 votes while Tegvir Singh Sibia and Col A.P. Singh got 266 and 176 votes, respectively. “Our agenda starts and ends with the greens. It is the heart of any golf course and we will pay maximum attention to its improvement. The main focus will be the maintenance of the greens. 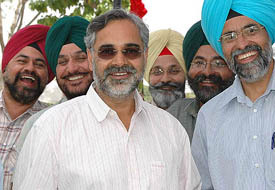 While promoting national events, we want to take it to international standards,” Sandhu said. Amidst an impromptu party triggered by his win, Sandhu, surrounded by his supporters and accepting congratulatory messages in the afternoon at the club, stated that the casual approach with regard to maintenance of the course would be addressed on a priority basis. “We are committed to importing new equipment, upkeep of the course, pruning and cutting grass and relaying one of the 18 greens at the club. Professional management of the club will also be a priority,” he added. The Himachal Government plans to celebrate the centenary of the Naldehra Golf Course, near here, on a grand scale to attract golf lovers from across the world. The local golf club, which manages the nine-hole course, will organise a series of tournaments to mark the centenary but the basic objective of the celebrations will be to promote tourism. The hill state wants to capitalise on its growing popularity of the sport and take advantage of its elite character to attract high-end tourists. As per the programme chalked out by the club, which has been given the go-ahead by the government for the celebrations, a series of events will be held from September 5. Besides professional golfers from the country, about 20 amateur international golfers will be seen in action during the fortnight-long celebrations. Separate competitive events will be held for international golfers, professional and amateur golfers from the country and women golfers. The events featuring celebrities will be the main attraction. Brig B.S. Kanwar, captain of the club, said invitations had been sent to various clubs across the world for participation in the events. The plan is to invite teams from two or three countries from each continent. The club is in touch with other golf clubs in the country to make the celebrations a grand success. He said the club organised the Shimla-Lahore Friendship Golf Tournament last year as a precursor to the centenary celebrations. A host of other activities were also being planned to make it a tourism promotion event. The state Tourism Department, the Tourism Development Corporation and other departments concerned will be involved in the mega celebrations and the club will be taking care of the sporting events. He said the golf course had been improved a lot since the Shimla-Lahore Friendship event and two new greens had been created. The 29-year-old American, who led by two strokes with two holes remaining in regulation play before producing a bogey-bogey finish, also reclaimed the world number one ranking from Vijay Singh. Woods, after a 71, and DiMarco, after a 68, finished level at 12-under 276 after 72 holes. DiMarco struck the flag at the last with a chip from in front of the green for the birdie-three that would have secured him the title. Woods appeared to have set up his third PGA Tour title of the year in regulation by producing a miracle birdie at the par-three 16th, holing out from 40 yards off the green with a delicate chip that spun back down the slope. Errant tee shots on 17 and 18, however, let DiMarco back in before the dramatic finish. 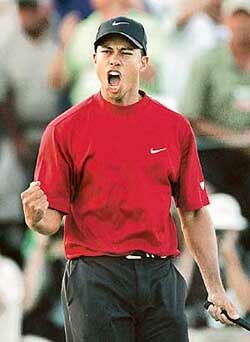 Woods, who ended a barren run of 10 majors since his previous triumph at the 2002 US Open, drew level on nine with fellow American Ben Hogan and South Africa’s Gary Player in all-time listings. US Open champion Retief Goosen, whose 67 was the best score of the final round, tied for third at five-under 283 with Great Britain’s Luke Donald, who eagled 13 and 15 on his way to a 69. Birdies at the first two holes of the final round put Woods four shots clear before he slipped back with a three-putt bogey at the par-four fifth. Although he also birdied the par-four ninth to reach the turn three clear at 13 under, he stumbled again at the par-four 10th after duffing a chip from just off the green. American Ryder Cup player DiMarco, who narrowly missed birdie putts on three, four and five, then holed a 35-footer at the par-four 11th to trim Woods’ lead to just one. DiMarco lost ground at the very next hole, the par-three 12th, when he was unable to get up and down from the back left fringe to save par. Woods, who parred, was once again two clear. At the par-four 14th, DiMarco once again cut the lead to one after hitting a superb approach to within two feet. Three ahead of the field after completing a seven-under-par 65 earlier in the day in the weather-delayed third round, Woods knew he had a battle on his hands with DiMarco’s approach play in sparkling order. Despite opening with a two-over-par 74 in the first major of the year, Woods swept to the top of the leaderboard with scores of 66 and 65 in the next two rounds. The Mandi Sportspersons Welfare Association (MSWA) and the Citizens’ Council Mandi (CCM) have joined hands against this move. They have submitted a memorandum to the Deputy Commissioner, Mr Ali Raza Rizvi, requesting him not to allow any association to operate from the stadium. Talking to The Tribune, the MSWA president, Mr TL Vaidya, said here today that they opposed the move as it would hit the cause of sports in Mandi. Mr Vaidya said the District Cricket Association had made a similar attempt earlier, but the state government had turned down its request. The Additional Deputy Commissioner, Mr RS Gupta, said the Wushu Association had given Rs 2 lakh grant to construct a multi-purpose hall in the Paddal ground. “400 sq mtrs land was earmarked for the association in November, but it would cater to other sports activities as well,” he said. Basketball fans cherished a cliff-hanger and the short-statured Mandi boys eventually won 40-39. In the under-13 girls’ final, it was bad luck again for Lawrence School as Kangra defeated them 40-32. In the under-17 girls’ final, Kangra defeated Nahan 40-32. In the under-17 boys’ final, Mandi defeated Sports Hostel, Paprola, 55-38. Thirteen teams participated in the sub-junior category and 16 in the junior category.